Thank you for your advocacy and support throughout 2018. 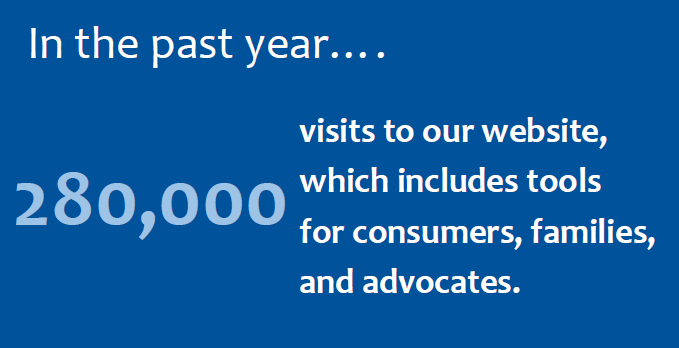 In every effort - educational materials, conference sessions, advocacy, and consumer training - we focus on our goal of “living in a world in which all consumers of long-term care, services, and supports are treated with respect and dignity.” Your donation ensures we can continue our advocacy and Stand for Quality Care. We cannot do this important work without you. Doubled the size of the Consumer Voice Advisory Council because too often policy shapers make decisions without hearing from actual consumers. The Councils’ 14 consumer members share their experiences in nursing homes, assisted living and home care, guide Consumer Voice advocacy, and address policy changes that will impact their own and other consumers’ daily lives. Met with CMS Administrator, Seema Verma, about the negative impacts of regulatory rollbacks and the need for strong enforcement. Briefed representatives from the House Energy and Commerce Oversight subcommittee, Office of Inspector General, General Accounting Office, and Department of Justice on issues relating to quality nursing home care and standards. ​Worked with Hill staff on legislation related to nursing home staffing, emergency preparedness, assisted living standards, forced arbitration, as well as advocated for increased funding for Ombudsman programs and to continue the Money Follows the Person Program. Stimulated consumer advocacy through Action Alerts. Challenged proposed changes to Medicaid that would limit access to nursing homes and result in residents needing to leave their homes. Empowered consumers and advocates with an expanded Online Training Center, providing training and concrete educational materials. Promoted quality care, strong regulations and resident respect with media including New York Times, ProPublica, NPR, and Kaiser Health News. Addressed consumer perspective on transfer/discharge, abuse, misuse of antipsychotic drugs, and other long-term care challenges. Provide a consumer perspective in analysis and advocacy on proposed laws, regulations, and policies from Congress and CMS that impact the care and quality of life of residents and other long-term care consumers. Advocate to stop the assault that continues on nursing home standards - including proposals to roll back important protections in the nursing home rules, efforts to further weaken the enforcement system, and a proposal to roll back brand-new emergency preparedness standards. Provide new and improved timely resources to residents, families, and advocates about rights, quality, and achieving good care in all settings. Promote quality practices, including staffing standards, individualized care, care planning, abuse prevention and response, and resident empowerment. Donate online, or send a check to 1001 Connecticut Ave NW, Suite 632, Washington DC 20036. Consider a monthly donation—any amount helps, $10, $20, $50 per month. Committing to $1,000 or more in a calendar year qualifies you for the President’s Circle of Leaders. Additional ways to contribute include donations of stock, PayPal Giving Fund, and through direct charitable contributions from your IRA*. Find more information about making a contribution here. We thank you in advance for your support! Your donation is greatly appreciated and will be used to keep these activities going year-round. *Did you know that charitable contributions made directly from your IRA annual distribution (for individuals age 70.5+) may be tax-free? Ask your financial advisor for more information.